It has become a well-known scientific fact that billions of years ago, Mars once had a thicker atmosphere and liquid water on its surface. Scientists have also discovered that it was the gradual loss of this atmosphere, between 4.2 and 3.7 billion years ago, that caused Mars to go from being a warmer, wetter environment to the dry, freezing environment it is today. Despite the existence of both a thicker atmosphere and water, questions remain as to whether or not Mars was truly habitable in the past. According to a new study from a team of researchers from the Los Alamos National Laboratory (LANL), the discovery of a specific mineral (boron) has added weight to the argument that Mars was once a potentially life-bearing world. The study, titled “In situ detection of boron by ChemCam on Mars“, was recently published in the scientific journal Geophysical Research Letters. For the sake of this study, the LANL research team consulted data collected by the Chemistry and Camera (ChemCam) instrument aboard the Curiosity rover, which showed evidence of boron on the surface of Mars. Boron, an element which is created by cosmic rays and is relatively rare in the Solar System, is necessary for the creation of ribonucleic acid – which is present in all forms of modern life. Essentially, RNA requires a key ingredient to form, which is a sugar called ribose. Like all sugars, ribose is highly unstable and decomposes quickly in water. As such, it needs another element to stabilize it, which is where boron comes into play. The boron was detected by Curiosity’s laser-shooting ChemCam instrument, which was developed by the LANL in conjunction with France’s space agency, the National Center of Space Studies (CNES). It detected the element in veins of calcium sulfate minerals located in the Gale Crater, which means that boron was present in Mars’ groundwater and was preserved with other minerals when the water dissolved, leaving behind rich mineral veins. This provides further evidence that the lake that is now known to have once filled the Gale Crater could have had life in it. During the time period in question, this lake would have experienced temperatures ranging from from 0 to 60 ° C (32 to 140 °F) and had a pH level that would have been neutral-to-alkaline. It also means that on ancient Mars, the conditions necessary for life would have existed, and independent of Earth to boot. This is just one of many findings Curiosity has made related to the composition of Martian rocks. Since it touched down in the Gale Crater in 2012, the rover has been gathering chemical evidence of the ancient lake that once existed there, as well as geological evidence that has been preserved by sedimentary deposits. As the rover began to scale the slope of Mount Sharp, the composition of the surface began to change. Whereas samples taken from the crater floor tended to contain more in the way of clays, samples collected higher up Mount Sharp contained more boron. These and other chemical traces are indications of how conditions under which sediments were deposited changed over time. Analysis conducted of the mountain’s layers has also showed how the movement of groundwater through these layers of sediment altered and transported elements (like boron). All of this is providing a picture of how Mars’ environment changed over the course of billions of years and affected the planet’s potential favorability for microbial life. And while scientists have a general picture of how Mars underwent a very significant transition billions of years ago, whether or not Martian life ever existed remains unknown. The main goal of the Curiosity mission was to determine whether the area ever offered a habitable environment. Thanks to evidence of past water and the discovery of minerals like boron, this has been confirmed. In the coming years, the deployment of the Mars 2020 rover is expected to follow-up on these findings and shed more light on Mars’ case for past habitability. Once it reaches the surface, the Mars 2020 rover – which relies on much of the same technology as Curiosity – will use an instrument called the Scanning Habitable Environments with Raman & Luminescence for Organics & Chemicals (SHERLOC). Also developed by the LANL, this “SuperCam” instrument will use spectrometers, a laser and a camera to search for organics and minerals that could indicate the existence of past microbial life. If there is still preserved evidence of life to be found on Mars or – fingers crossed! – microbial life still exists there today, we can expect to find it before long. If that should be the case, human beings will finally know with certainty that life evolved on a planet other than Earth, and perhaps independent of it! Rolling up the slopes of Mt. Sharp recently, NASA’s Curiosity rover appears to have stumbled across yet another meteorite, its third since touching down nearly four and a half years ago. While not yet confirmed, the turkey-shaped object has a gray, metallic luster and a lightly-dimpled texture that hints of regmaglypts. Regmaglypts, indentations that resemble thumbprints in Play-Doh, are commonly seen in meteorites and caused by softer materials stripped from the rock’s surface during the brief but intense heat and pressure of its plunge through the atmosphere. Oddly, only one photo of the assumed meteorite shows up on the Mars raw image site. Curiosity snapped the image on Jan. 12 at 11:21 UT with its color mast camera. If you look closely at the photo a short distance above and to the right of the bright reflection a third of the way up from the bottom of the rock, you’ll spy three shiny spots in a row. Hmmm. Looks like it got zapped by Curiosity’s ChemCam laser. 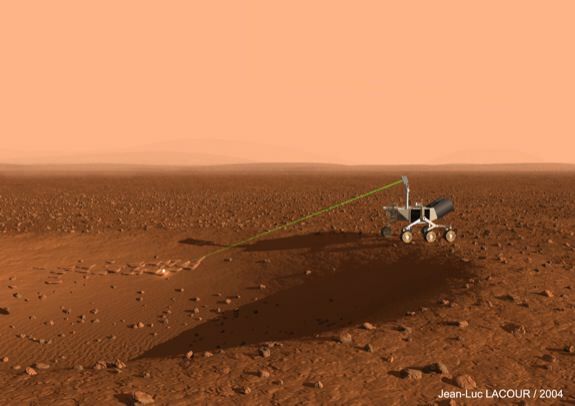 The rover fires a laser which vaporizes part of the meteorite’s surface while a spectrometer analyzes the resulting cloud of plasma to determine its composition. The mirror-like shimmer of the spots is further evidence that the gray lump is an iron-nickel meteorite. Curiosity has driven more than 9.3 miles (15 km) since landing inside Mars’ Gale Crater in August 2012. It spent last summer and part of fall in a New Mexican-like landscape of scenic mesas and buttes called “Murray Buttes.” It’s since departed and continues to climb to sequentially higher and younger layers of the lower part of Mt. Sharp to investigate additional rocks. Scientists hope to create a timeline of how the region’s climate changed from an ancient freshwater lake environment with conditions favorable for microbial life (if such ever evolved) to today’s windswept, frigid desert. Assuming the examination of the rock proves a metallic composition, this new rock would be the eighth discovered by our roving machines. All of them have been irons despite the fact that at least on Earth, iron meteorites are rather rare. About 95% of all found or seen-to-fall meteorites are the stony variety (mostly chondrites), 4.4% are irons and 1% stony-irons. NASA’s Opportunity rover found five metal meteorites, and Curiosity’s rumbled by its first find, a honking hunk of metallic gorgeousness named Lebanon, in May 2014. If this were Earth, the new meteorite’s smooth, shiny texture would indicate a relatively recent fall, but who’s to say how long it’s been sitting on Mars. The planet’s not without erosion from wind and temperature changes, but it lacks the oxygen and water that would really eat into an iron-nickel specimen like this one. Still, the new find looks polished to my eye, possibly smoothed by wind-whipped sand grains during the countless Martian dust storms that have raged over the eons. Why no large stony meteorites have yet to be been found on Mars is puzzling. They should be far more common; like irons, stonies would also display beautiful thumprinting and dark fusion crust to boot. Maybe they simply blend in too well with all the other rocks littering the Martian landscape. Or perhaps they erode more quickly on Mars than the metal variety. Every time a meteorite turns up on Mars in images taken by the rovers, I get a kick out of how our planet and the Red One not only share water, ice and wind but also getting whacked by space rocks. For over a year, the Curiosity rover has been making its way up the slopes of Mount Sharp, the central peak within the Gale Crater. As the rover moves higher along this formation, it has been taking drill samples so that it might look into Mars’ ancient past. Combined with existing evidence that water existed within the crater, this would have provided favorable conditions for microbial life. And according to the most recent findings announced by the Curiosity science team, the upper levels of the mountain are rich in minerals that are not found at the lower levels. These findings reveal much about how the Martian environment has changed over the past few billion years, and are further evidence that Mars may have once been habitable. The findings were presented at the Fall meeting of the American Geophysical Union (AGU), which began on Monday, Dec. 12th, in San Fransisco. During the meeting, John Grotzinger – the Fletcher Jones Professor of Geology at Caltech and the former Project Scientist for the Curiosity mission – and other members of Curiosity’s science team shared what the rover discovered while digging into mineral veins located in the higher, younger layers of Mount Sharp. To put it simply, mineral veins are a great way to study the movements of water in an area. This is due to the fact that veins are the result of cracks in layered rock being filled with chemicals that are dissolved in water – a process which alters the chemistry and composition of rock formations. What the rover found was that at higher layers hematite, clay minerals and boron are more abundant than what has been observed at lower, older layers. At present, no evidence has been found that microbial life actually existed on Mars in the past. However, since it first landed back in 2012, the Curiosity mission has uncovered ample evidence that conditions favorable to life existed billions of years ago. This is possible thanks to the fact that Mount Sharp consists of layered sedimentary deposits, where each one is younger than the one beneath it. These sedimentary layers act as a sort of geological and environmental record for Mars; and by digging into them, scientists are able to get an idea of what Mars’ early history looked like. In the past, Curiosity spent many years digging around in the lower layers, where it found evidence of liquid water and all the key chemical ingredients and energy needed for life. Since that time, Curiosity has climbed higher along Mount Sharp and examined younger layers, the purpose of which has been to reconstruct how the Martian environment changed over time. As noted, the samples Curiosity recently obtained showed greater amounts of hematite, clay minerals and boron. All of these provide very interesting clues as to what kinds of changes took place. For instance, compared to previous samples, hematite was the most dominant iron oxide mineral detected, compared to magnetite (which is a less-oxidized form of iron oxide). The presence of hematite, which increases with distance up the slope of Mount Sharp, suggests both warmer conditions and more interaction with the atmosphere at higher levels. The increasing concentration of this minerals – relative to magnetite at lower levels – also indicates that environmental changes have occurred where the oxidation of iron increased over time. This process, in which more electrons are lost via chemical exchanges, can provide the energy necessary for life. In addition, Curiosity’s Chemistry and Camera (ChemCam) instrument has also noted increased (but still minute)) levels of borons within veins composed primarily of calcium sufate. On Earth, boron is associated with arid sites where water has evaporated, and its presence on Mars was certainly unexpected. No previous missions have ever detected it, and the environmental implications of it being present in such tiny amounts are unclear. On the one hand, it is possible that evaporation within the lake bed created a boron-deposit deeper inside Mount Sharp. The movement of groundwater within could have then dissolved some of this, redepositing trace amounts at shallower levels where Curiosity was able to reach it. On the other hand, it could be that changes in the chemistry of clay-bearing deposits affected how boron was absorbed by groundwater and then redeposited. It seems that with every discovery, the long history of “Earth’s Twin” is becoming more accessible, yet more mysterious. The more we learn about it past and how it came to be the cold, desiccated place we know today, the more we want to know! On the eve of the 3rd anniversary since her nail biting touchdown inside Gale Crater, NASA’s car sized Curiosity Mars Science Laboratory (MSL) rover has discovered a new type of Martian rock that’s surprisingly rich in silica – and unlike any other targets found before. 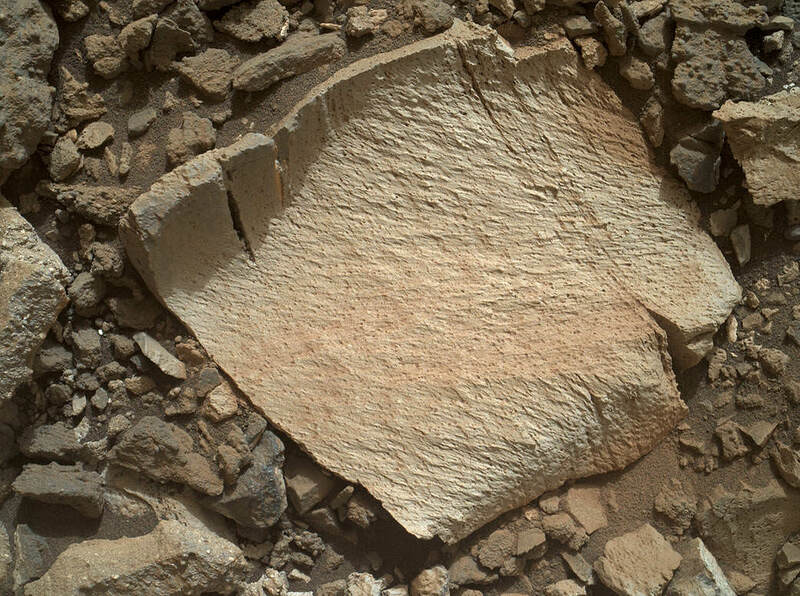 Excited by this new science finding on Mars, Curiosity’s handlers are now gearing the robot up for her next full drill campaign today, July 31 (Sol 1060) into a rock target called “Buckskin” – which lies at the base of Mount Sharp, the huge layered mountain that is the primary science target of this Mars rover mission. “The team selected the “Buckskin” target to drill,” says Lauren Edgar, Research Geologist at the USGS Astrogeology Science Center and an MSL science team member, in a mission update. See the rover at work reaching out with her robotic arm and drilling into Buckskin, as illustrated in our new mosaics of navcam camera images created by the image processing team of Ken Kremer and Marco Di Lorenzo (above and below). Also featured at Alive Universe Images – here. For about the past two months, the six wheeled robot has been driving around and exploring a geological contact zone named “Marias Pass” – an area on lower Mount Sharp, by examining the rocks and outcrops with her suite of state-of-the-art science instruments. The goal is to provide geologic context for her long term expedition up the mountains sedimentary layers to study the habitability of the Red Planet over eons of time. Data from Curiosity’s “laser-firing Chemistry & Camera (ChemCam) and Dynamic Albedo of Neutrons (DAN), show elevated amounts of silicon and hydrogen, respectively,” in certain local area rocks, according to the team. Silica is a rock-forming compound containing silicon and oxygen, commonly found on Earth as quartz. Therefore the team scouted targets suitable for in depth analysis and sample drilling and chose “Buckskin”. An initial test bore operation was conducted first to confirm whether that it was indeed safe to drill into “Buckskin” and cause no harm to the rover before committing to the entire operation. The bore hole is about 1.6 cm (0.63 inch) in diameter. “This test will drill a small hole in the rock to help determine whether it is safe to go ahead with the full hole,” elaborated Ryan Anderson, planetary scientist at the USGS Astrogeology Science Center and an MSL science team member. So it was only after the team received back new high resolution imagery last night from the arm-mounted MAHLI camera which confirmed the success of the mini-drill operation, that the “GO” was given for a full depth drill campaign. MAHLI is short for Mars Hand Lens Imager. “We successfully completed a mini drilling test yesterday (shown in the MAHLI image). That means that today we’re going for the FULL drill hole” Edgar confirmed. So it’s a busy day ahead on the Red Planet, including lots of imaging along the way to document and confirm that the drilling operation proceeds safely and as planned. “First we’ll acquire MAHLI images of the intended drill site, then we’ll drill, and then we’ll acquire more MAHLI images after drilling,” Edgar explains. “The plan also includes Navcam imaging of the workspace, and Mastcam imaging of the target and drill bit. In addition to drilling, we’re getting CheMin ready to receive sample in an upcoming plan. Fingers crossed!” Surface observations with the arm-mounted Alpha Particle X-ray Spectrometer (APXS) instrument are also planned. If all goes well, the robot will process and pulverize the samples for eventual delivery to the onboard pair of miniaturized chemistry labs located inside her belly – SAM and CheMin. Tiny samples will be fed to the inlet ports on the rover deck through the sieved filters. Anderson says the target is a bright patch on a nearby outcrop. Via active and passive observations with the mast-mounted ChemCam laser and Mastcam multispectral imager, the purpose is to determine if “Ch-paa-qn” is comprised of calcium sulfate like other white veins visible nearby, or perhaps it’s something else entirely. Before arriving by the “Lion” outcrop last week, Curiosity was investigating another outcrop area nearby, the high-silica target dubbed “Elk” with the ChemCam instrument, while scouting around the “Marias Pass” area in search of tasty science targets for in-depth analysis. Sometimes the data subsequently returned and analyzed is so extraordinary, that the team decides on a return trip to a spot previously departed. Such was the case with “Elk” and the rover was commanded to do a U-turn to acquire more precious data. “One never knows what to expect on Mars, but the Elk target was interesting enough to go back and investigate,” said Roger Wiens, the principal investigator of the ChemCam instrument from the Los Alamos National Laboratory in New Mexico. Soon, ChemCam will have fired on its 1,000th target. Overall the laser blaster has been fired more than 260,000 times since Curiosity landed inside the nearly 100 mile wide Gale Crater on Mars on Aug. 6, 2012, alongside Mount Sharp. “ChemCam acts like eyes and ears of the rover for nearby objects,” said Wiens. “Marias Pass” is a geological context zone where two rock types overlap – pale mudstone meets darker sandstone. “We found an outcrop named Missoula where the two rock types came together, but it was quite small and close to the ground. We used the robotic arm to capture a dog’s-eye view with the MAHLI camera, getting our nose right in there,” said Ashwin Vasavada, the mission’s project scientist at NASA’s Jet Propulsion Laboratory in Pasadena, California. White mineral veins, possibly comprised of calcium sulfate, filled the fractures by depositing the mineral from running groundwater. “Such clues help scientists understand the possible timing of geological events,” says the team. Read more about Curiosity in an Italian language version of this story at Alive Universe Images – here. As of today, Sol 1060, July 31, 2015, she has taken over 255,000 amazing images. Curiosity recently celebrated 1000 Sols of exploration on Mars on May 31, 2015 – detailed here with our Sol 1000 mosaic also featured at Astronomy Picture of the Day on June 13, 2015. Curiosity has zapped hundreds of Red Planet rocks with her powerful laser blaster during her lifetime and has now caught the sparks flying for the first time as they happened – as seen in new photos and video above and below released this week by NASA. 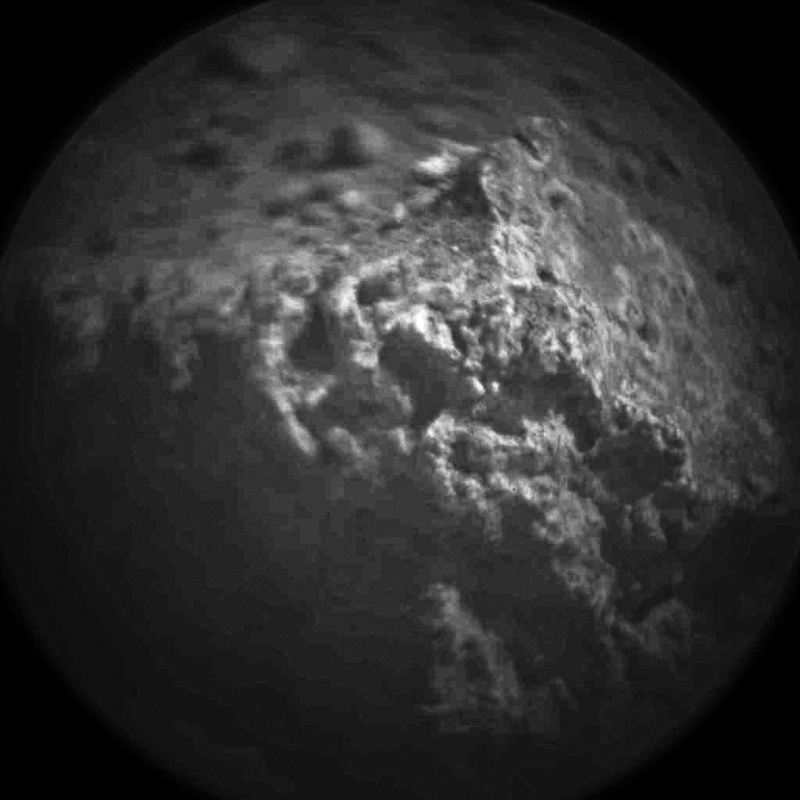 As the NASA rover’s million watt Chemistry and Camera (ChemCam) instrument fired multiple laser shots at a rock fortuitously named “Nova” the team commanded her arm-mounted Mars Hand Lens Imager (MAHLI) high resolution imaging camera to try and capture the action as it occurred, for the first time. And they succeeded. Curiosity blasted the baseball sized “Nova” rock target over 100 times on July 12, 2014, or Sol 687. Since the nail biting touchdown nearly two years ago on Aug. 5, 2012 inside Gale Crater, ChemCam has aimed the laser instrument at more than 600 rock or soil targets and fired more than 150,000 laser shots. ChemCam is used to determine the composition of Martian rocks and soils at a distance of up to 25 feet (8 meters) yielding preliminary data for the scientists and engineers to decide if a target warrants up close investigation and in rare cases sampling and drilling activities. ChemCam works through a process called laser-induced breakdown spectroscopy. The laser hits a target with pulses to generate sparks, whose spectra provide information about which chemical elements are in the target. Successive laser shots are fired in sequence to gradually blast away thin layers of material. Each shot exposes a slightly deeper layer for examination by the ChemCam spectrometer. 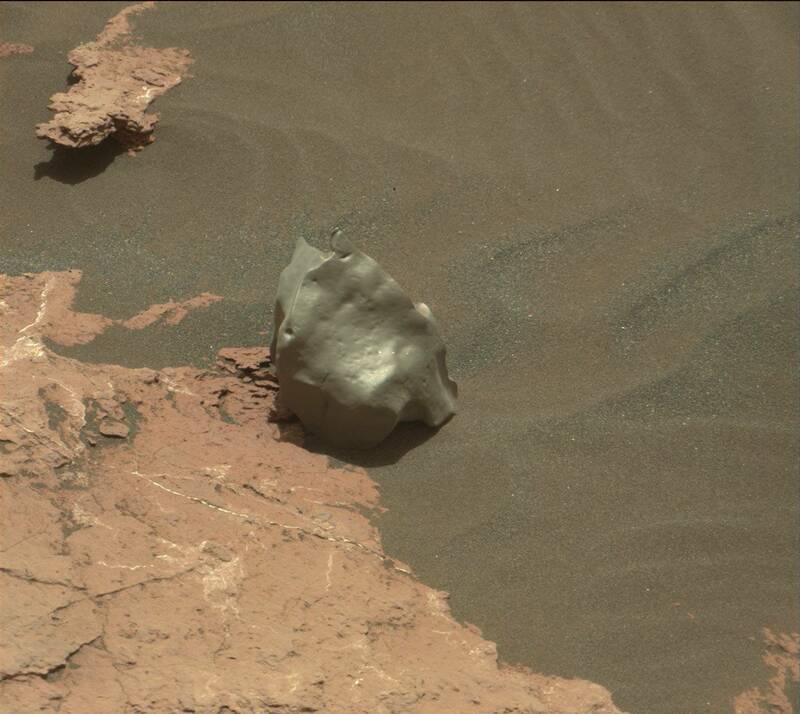 As Curiosity fired deeper into “Nova” it showed an increasing concentration of aluminum as the sequential laser blasts penetrated through the uninteresting dust on the rock’s surface. Silicon and sodium were also detected. “This is so exciting! The ChemCam laser has fired more than 150,000 times on Mars, but this is the first time we see the plasma plume that is created,” said ChemCam Deputy Principal Investigator Sylvestre Maurice, at the Research Institute in Astrophysics and Planetology, of France’s National Center for Scientific Research and the University of Toulouse, France, in a statement. The SUZ sized rover is driving as swiftly as possible to the base of Mount Sharp which dominates the center of Gale Crater and reaches 3.4 miles (5.5 km) into the Martian sky – taller than Mount Rainier. During Year 1 on Mars, Earth’s emissary has already accomplished her primary objective of discovering a habitable zone on the Red Planet that contains the minerals necessary to support microbial life in the ancient past when Mars was far wetter and warmer billions of years ago. To date, Curiosity’s odometer totals over 5.1 miles (8.4 kilometers) since landing inside Gale Crater on Mars in August 2012. She has taken over 166,000 images. Curiosity still has about another 2.4 miles (3.9 kilometers) to go to reach the entry way at a gap in the treacherous sand dunes at the foothills of Mount Sharp sometime later this year. Stay tuned here for Ken’s continuing Curiosity, Opportunity, Orion, SpaceX, Boeing, Orbital Sciences, commercial space, MAVEN, MOM, Mars and more planetary and human spaceflight news. Talk about heavy metal! This shiny, lumpy rock spotted by NASA’s Curiosity rover is likely made mostly of iron — and came from outer space! It’s an iron meteorite, similar to ones found in years past by Curiosity’s forerunners Spirit and Opportunity, but is considerably larger than any of the ones the MER rovers came across… in fact, at 2 meters (6.5 feet) wide this may very well be the biggest meteorite ever discovered on Mars! Click the image for a supermetallicious high-resolution version from JPL’s Planetary Photojournal. The picture above was made by combining high-resolution circular images (outlined in white) acquired with the Remote Micro-Imager (RMI) of Curiosity’s ChemCam instrument with color and context from the rover’s Mastcam. The images were taken on mission Sol 640 (May 25, 2014) and have been adjusted to simulate more Earth-like illumination. Find more news and images from the MSL mission on the JPL site here. *Note: that isn’t to say iron meteorites can’t be eroded; on the contrary, much of their signature surface sheen and pitted texture comes from various erosion processes. See a related study from J. W. Ashley et al. here. The reports are in: it appears that Earth has the upper hand in firing laser shots on Mars. More seriously, however, the Curiosity rover has surpassed the uber-cool milestone of shooting 100,000 holes in the Red Planet’s surface to learn more about its chemical composition. As you can see in the picture, the 100,000th shot took place on a rock nicknamed “Ithaca” on Oct. 30 from a distance of 13 feet, 3 inches (4.04 meters) away. (The news was just announced recently; as of early December, the laser had fired more than 102,000 times). “The Chemistry and Camera instrument (ChemCam) uses the infrared laser to excite material in a pinhead-size spot on the target into a glowing, ionized gas, called plasma. ChemCam observes that spark with the telescope and analyzes the spectrum of light to identify elements in the target,” NASA stated. You can read more about the laser instrument here. PEWPEWPEWPEWPEW! Curiosity’s head-mounted ChemCam did a little target practice on August 25, blasting millimeter-sized holes in a soil sample named “Beechey” in order to acquire spectrographic data from the resulting plasma glow. The neat line of holes is called a five-by-one raster, and was made from a distance of about 11.5 feet (3.5 meters). Sorry Obi-Wan, but Curiosity’s blaster is neither clumsy nor random! Mounted to Curiosity’s “head”, just above its Mastcam camera “eyes”, ChemCam combines a powerful laser with a telescope and spectrometer that can analyze the light emitted by zapped materials, thereby determining with unprecedented precision what Mars is really made of. For five billionths of a second the laser focuses a million watts of energy onto a specific point. Each of the 5 holes seen on Beechey are the result of 50 laser hits. 2 to 4 millimeters in diameter, the holes are much larger than the laser point itself, which is only .43 millimeters wide at that distance. Visit the official ChemCam site for more information. While Curiosity has been getting a good look around its landing spot on Mars, taking in the sights and sending back some impressive views of distant hills and Gale Crater’s enormous central peak, it’s also been peering very closely at some tiny targets just meters away — with its head-mounted, laser-powered and much-touted ChemCam. The images above and below were acquired by ChemCam’s Remote Micro-Imager on August 21, the 15th “Sol” of the mission. A full-sized image accessed from the public MSL mission site, it’s been brightened quite a bit to show the details of the target rocks. Mounted to Curiosity’s “head”, just above its Mastcam camera “eyes”, ChemCam combines a powerful laser with a telescope and spectrometer that can analyze the light emitted by zapped materials, thereby determining with unprecedented precision what Mars’ rocks are really made of. Because ChemCam uses a laser, Curiosity can examine many targets — up to a dozen — within a small time period without having to drive right up to them. Even the dustiest rocks won’t pose a problem for ChemCam – one or two zaps with its laser will be enough to vaporize any loose surface material. See the latest images from the MSL mission — including more ChemCam pictures — here. Images: NASA/JPL-Caltech/LANL. Edited by J. Major.